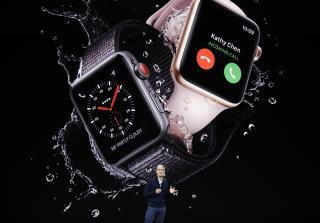 (Newser) – Talk about a PR mess: Apple's new smartwatch goes on sale Friday in stores as the company scrambles to fix a glitch with its biggest new feature, reports the Wall Street Journal. The $399 Apple Watch Series 3 with LTE is supposed to allow users to connect to cellular networks while on the go, but reviewers have repeatedly run into problems connecting. The upshot is that they were unable to do such basic tasks as making calls, sending texts, or using Siri. (Read a first-person account at the Verge.) Apple acknowledged the problem Wednesday and said it's working on a fix, one expected to arrive in a future software upgrade. but it can show the time in ANIMATED POO! How does this not show up in beta testing? At least you can legally board a plane with it. After having my iphone 6 replaced 4 times in 2 years because of quality issues, it was obvious apple has decided to give making quality products the pink slip. I remember one time asking the tech at the store if this was a pervasive issues (my bluetooth and wifi stopped working) he was like no this is the first time I have seen. I responded, well your forums have lots of people complaining about it. "Oh you know, people on the internet say anything"